The Champlain Valley Unitarian Universalist Society (CVUUS) exists to spiritually nourish, challenge, and sustain people of all ages and circumstances, so that they might lead lives of meaning, integrity, and service. 1. The highest priority is that people of all ages are opened to deeper connections with themselves, others, and the spirit of life. 1. A. Children and youth are capable of reflecting on their experiences in age-appropriate ways with reference to Unitarian Universalist principles, sources, and history. 1. B. 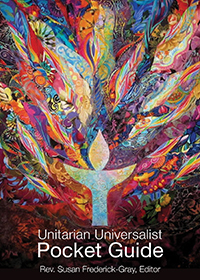 Adults grow and develop spiritually within the context of Unitarian Universalist principles, sources, and history. 1. C. People of all ages are able to discover and live their calling in the world. 2. The second priority is that people who participate in the life of CVUUS are in “right relationship” with one another and the wider community. 2. A. People of all ages live their UU values. 2. B. CVUUS welcomes the participation of all who support our principles and demonstrates a culture of accepting, supporting, encouraging, and caring for one another that permeates all congregational activities. 3. The third priority is that people who participate in the life of CVUUS are connected to a purpose beyond individual and congregational self-interest. 3. A. Children and youth understand the importance of service and perform age-appropriate acts of service to others. 3. B. Adults participate in service activities within and outside the CVUUS community. 3. C. CVUUS sponsors and participates in community service activities as a congregation. 3. D. CVUUS visibly and actively promotes social and economic justice, and living in harmony with the earth. A purpose statement is about impact and the results we wish to achieve. Purpose statements are written about the future, but in the present tense, describing what CVUUS would look like if we accomplished everything we wanted to. The purpose statement should reflect the values of the congregation, describing those results that are most important to us. The CVUUS Board presented a draft of this statement to the congregation at its spring 2011 annual meeting. After congregational discussion and fine-tuning by the Board, the congregation affirmed this statement of purpose at a November, 2011 congregational meeting.